Peppers play a central role in Balkan gastronomy, and are particularly important to Macedonian cuisine. They are one of most cultivated and consumed vegetables in the region and are enjoyed with most meals. In September the markets display dozens of varieties, of every color and form imaginable, each of which has a distinct use: the long flat peppers are used to make ajvar (the pepper cream found across the Balkans), the round peppers are better suited to preserving, certain varieties are used fresh in dishes such as stuffed peppers and others are used to make paprika. 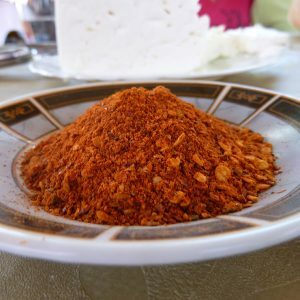 Bukovo, a small village situated a few kilometers from Bitola in southern Macedonia, has been famous through history for producing the best pepper seasoning, typically ground and added to soups and grilled meats. 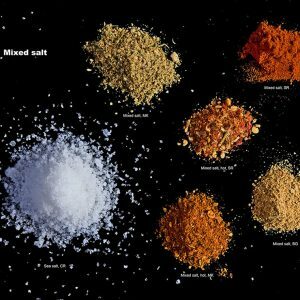 The region is so well known for being one of the best suited to this production, that today in Macedonia the term “bukovec” is used to refer to any dried and crushed pepper mix, used as a spice. Cultivated from self-produced seeds (from the variety commonly known as staro seme, or “ancient seeds”), the Bukov pepper has an elongated shape, a fine but meaty flesh and thick skin. After harvest, the peppers are tied in long wreaths and left to dry first in the sun and then, when autumn arrives, in ovens (at a low temperature for a few hours). When the peppers are ready, they are ground in traditional wooden mortars called kutle, until a coarse mix is achieved, which is then sieved. This work is typically carried out on winter days, during the break from working in the fields. Intense ruby red in color, ground Bukovo pepper is sweet, aromatic, slightly spicy and has a long and pleasant finish. The cultivation of peppers on Bukovo’s highlands is economically disadvantageous, in comparison to the plains, and it is diffi cult to distinguish authentic Bukovo peppers on the market. The village’s few remaining producers are predominately elderly and cultivate a diminishing quantity of the peppers, which they sell to friends and acquaintances. However, Bukovo pepper is a high quality product and could become an important economic and social resource for this community. For this purpose, the producers established the Producers’ Association “Bukovsko Biber” and work with the Slow Food Foundation to: select and revive seeds and maintain the purity of the varieties; improve preservation methods and product packaging; defi ne a production protocol that allows for a uniform product quality; and promote the product on the market, defending it from imitations.